Stories on the reclusive heiress Huguette Clark and the battle over her estate. We take a first tour of the opulent summer home of the late reclusive heiress Huguette Clark in Santa Barbara, Calif. The Manhattan district attorney has closed without any charges the investigation into the $300 million fortune of reclusive heiress Huguette Clark. After sitting empty for more than 60 years, the "extra" mansion of reclusive heiress Huguette Clark in Connecticut has found a buyer at $14.3 million. Monet and Renoir paintings from the collection of reclusive heiress Huguette Clark, hidden away for nearly a century, will be on view. Published Jan. 30, 2014. A group agreed to withdraw its appeal of a settlement over the $300 million estate of the reclusive heiress Huguette Clark. Published Sept. 27, 2013. A deal has been reached to divide up the $300 million estate of reclusive heiress Huguette Clark. Published Sept. 24, 2013. A proposed settlement in the $300 million estate of heiress Huguette Clark would give more than $30 million to her relatives. Published Sept. 20, 2013. The third of three excerpts from the book "Empty Mansions: The Mysterious Life of Huguette Clark and the Spending of a Great American Fortune." The second of three excerpts from the book "Empty Mansions: The Mysterious Life of Huguette Clark and the Spending of a Great American Fortune." The first of three excerpts from the book "Empty Mansions: The Mysterious Life of Huguette Clark and the Spending of a Great American Fortune." With one month until trial, settlement negotiations are being held to divide up the $300 million estate of reclusive heiress Huguette Clark. Published Aug. 16, 2013. Timothy Gray, a long-lost relative of the reclusive heiress Huguette Clark, was found dead under a Union Pacific Railroad overpass in Wyoming. Published Dec. 30, 2012. The nurses, doctors, hospital, attorney and accountant for Huguette Clark received $44 million in gifts, a lawsuit claims. Published May 23, 2012. The prime minister of Qatar was rebuffed in his attempt to spend $31.5 million for two of the New York apartments of Huguette Clark. Published May 7, 2012. The jewelry collection of Huguette Clark was sold at auction, fetching $18.3 million, far above the pre-sale estimate. Published April 17, 2012. A Degas pastel that disappeared from the living room of heiress Huguette Clark ended up in the living room of tax man Henry Bloch. Published March 14, 2012. The three New York apartments of the mysterious heiress Huguette Clark have been listed with an asking price of $55 million. Published March 9, 2012. The relatives of copper mining heiress Huguette Clark have gone to court to challenge her will, claiming fraud by her attorney, accountant and nurse. Published Feb. 15, 2012. Based on evidence of tax fraud, a judge suspended the attorney and accountant for reclusive copper heiress Huguette Clark. Published Dec. 23, 2011. A New York official has accused the attorney and accountant for mysterious heiress Huguette Clark of a tax fraud. Published Dec. 21, 2011. Reclusive heiress Huguette Clark signed two wills, the first one benefiting her family, the second one cutting out her family altogether. Published Nov. 28, 2011. More than $3 million dollars on dolls. Nearly $2 million to her attorney's favorite charity. And a magic bottomless checking account. Published Nov. 19, 2011. The attorney and accountant of reclusive heiress Huguette Clark stand to receive $500,000 each from her will, and her nurse about $30 million. Published May 26, 2011. No funeral Mass, no priest, no mourners at tomb of 104-year-old daughter of copper tycoon and senator. Published May 26, 2011. With her mansions empty, she lived in a hospital room for decades. A criminal investigation into handling of her fortune continues. Published May 24, 2011. A judge rejected the request of Huguette Clark's relatives to appoint a guardian for the 104-year-old heiress, saying their claim relies on hearsay. Published Sept. 10, 2010. Huguette Clark's lawyer won't say if he's named in her will, acknowledges soliciting gift of $1.5 million for his family's community. Published Sept. 8, 2010. Huguette Clark's relatives seek a guardian, as the criminal investigation of her money men continues. Published Sept. 3, 2010. The longtime nurse for Huguette Clark received four houses from the reclusive heiress. Published Sept. 1, 2010. Readers have prompted New York City officials to start checking on the welfare of Huguette Clark, the reclusive 104-year-old heiress with three empty mansions. Published Aug. 24, 2010. Part two of a special report on heiress Huguette Clark and the men managing her money. Published Aug. 20, 2010. Part one of a special report on reclusive heiress Huguette Clark and the men managing her money. Published Aug. 19, 2010. A $100 million mansion, waiting as if someone has gone off for the weekend. TODAY's Bob Dotson reports. Published July 30, 2010. TODAY Video: Where Is Mystery Heiress? The estates of fabulously wealthy heiress Huguette Clark have been empty for decades. The TODAY Show's Bob Dotson reports. Published July 30, 2010. Explore the original photo narrative from NBC News: Why are the mansions of one of America’s richest women sitting vacant? Published Feb. 26, 2010. Notes to accompany the photo narrative from NBC News: The Clarks, an American Family of Wealth, Scandal and Mystery. Published Feb. 26, 2010. A printable version of the original photo narrative on reclusive heiress Huguette Clark and her empty mansions. Published Feb. 26, 2010. Frozen in time since the 1950s, Bellosguardo, the estate of reclusive heiress Huguette Clark in Santa Barbara, has been kept up for $40,000 per month. 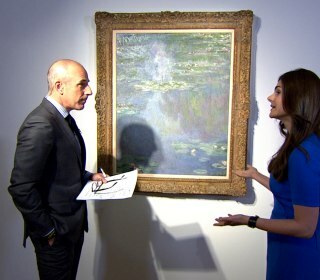 The possessions of one of the wealthiest and most secretive women in America, including a Monet and a Stradivarius violin, are being auctioned off.